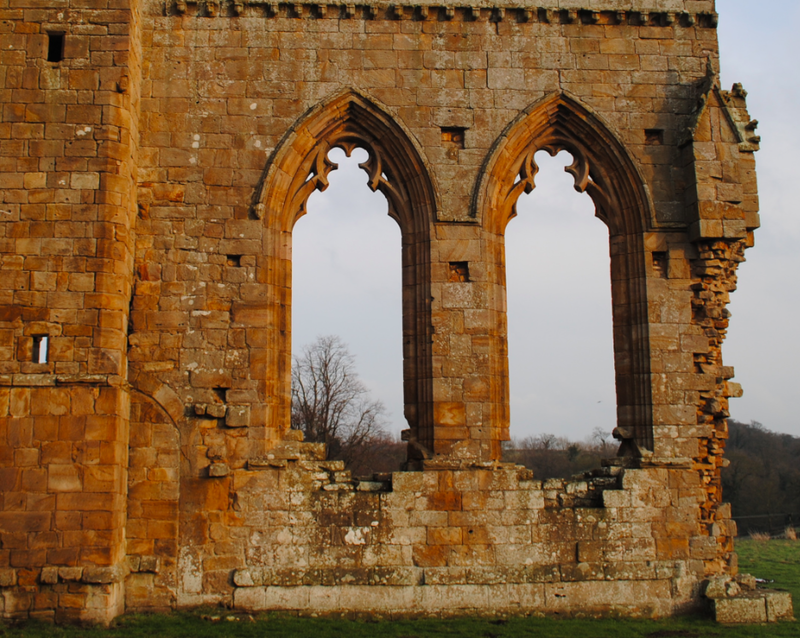 On the southern bank of the River Tees stand the ruins of Egglestone Premonstratensian Abbey. The church and cloister was a small narrow building and was first constructed in 1195-1225. 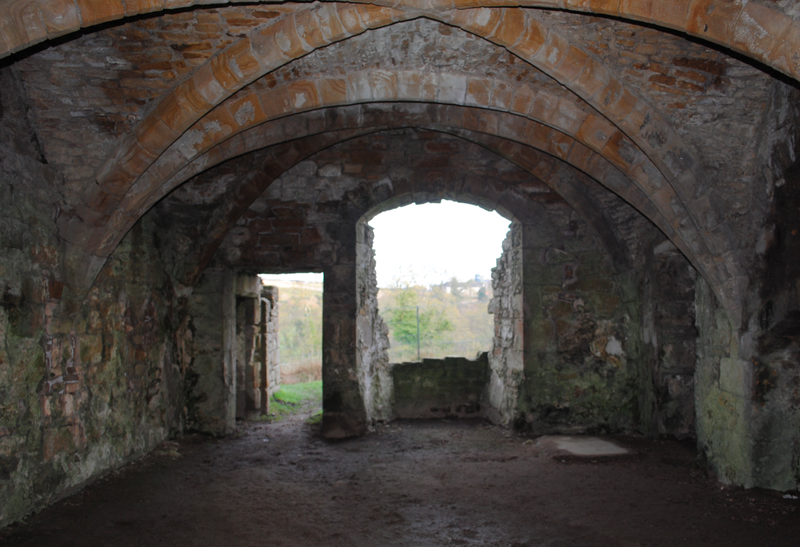 In circa 1250, the presbytery was rebuilt and the nave enlarged. 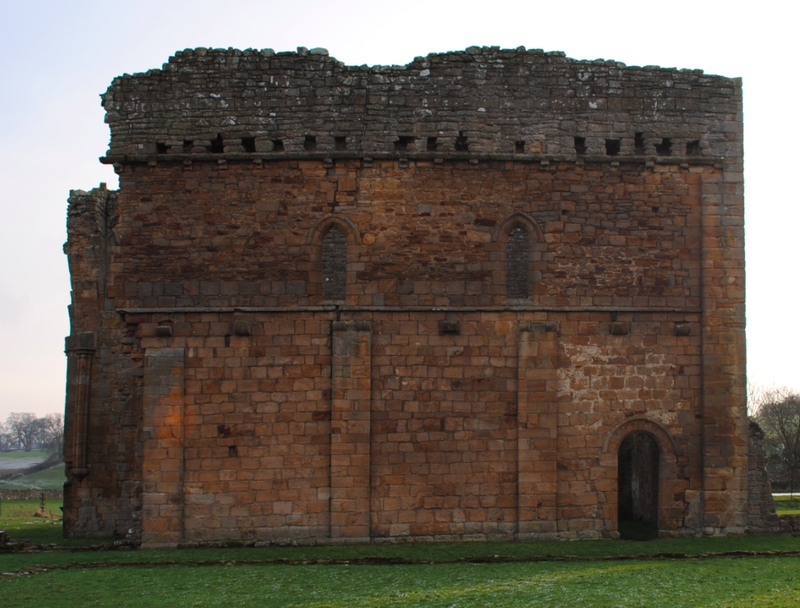 The north and west walls of the nave are the only surviving parts of the original church. 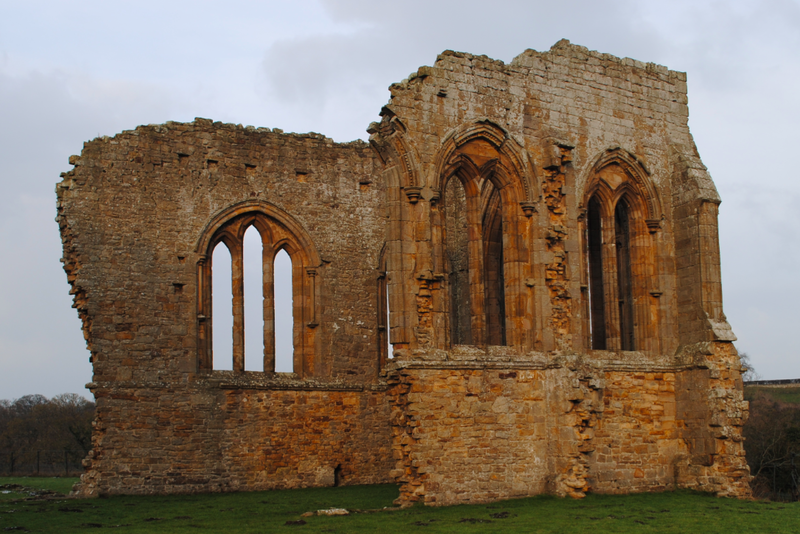 The Abbey was founded between 1195 – 1198, by the de Multon family, for Premonstratensian canons and was constructed of squared stone and rubble. The cruciform plan church almost lost its Abbey status as a result of the poverty suffered by the canons throughout their history. 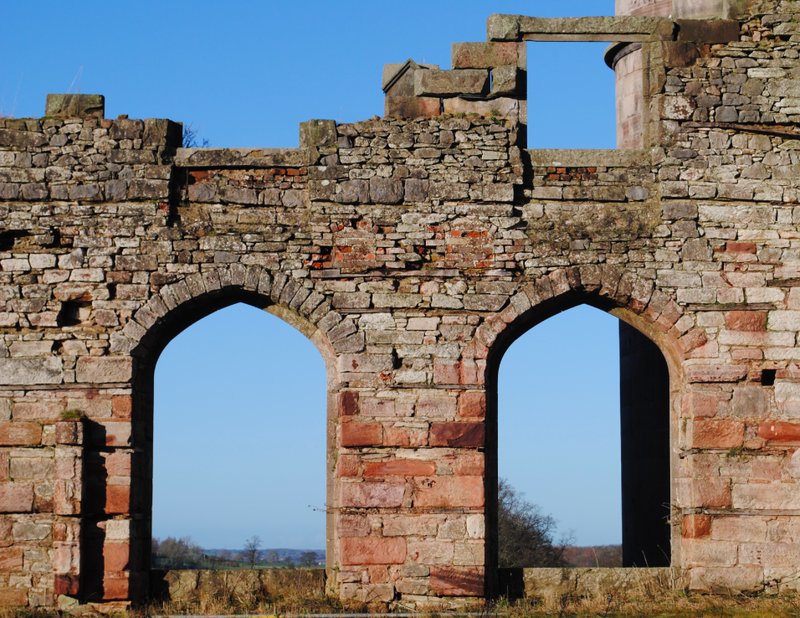 Known as ‘white monks’, the Canons undertook preaching and pastoral work in the region but followed the Cistercian rule of austerity. 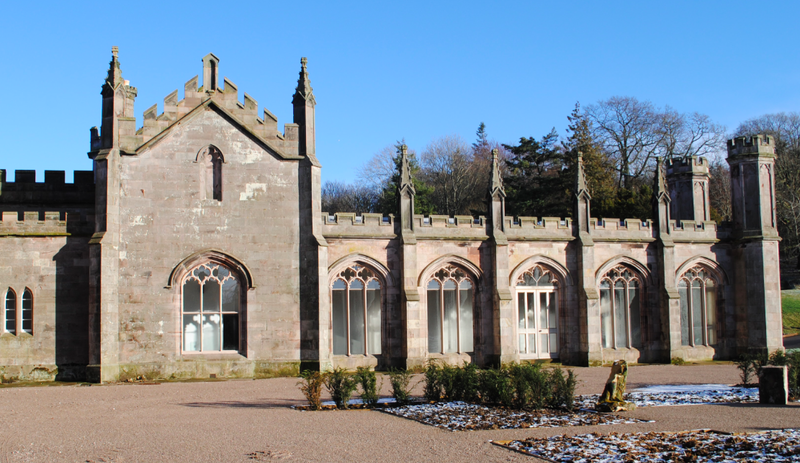 The five light east window (above) consists of four tall straight moulded mullions with no tracery. 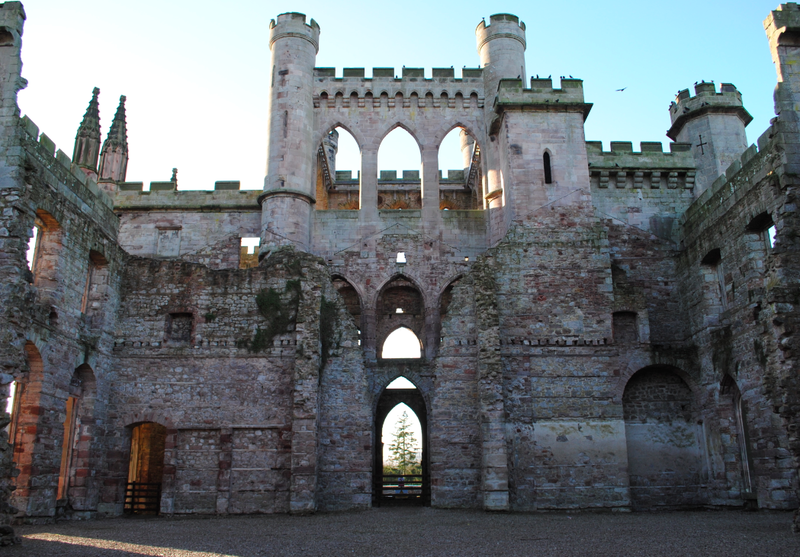 After the Dissolution in 1538, the north and east ranges were converted to a manorial hall by Robert Strelley. 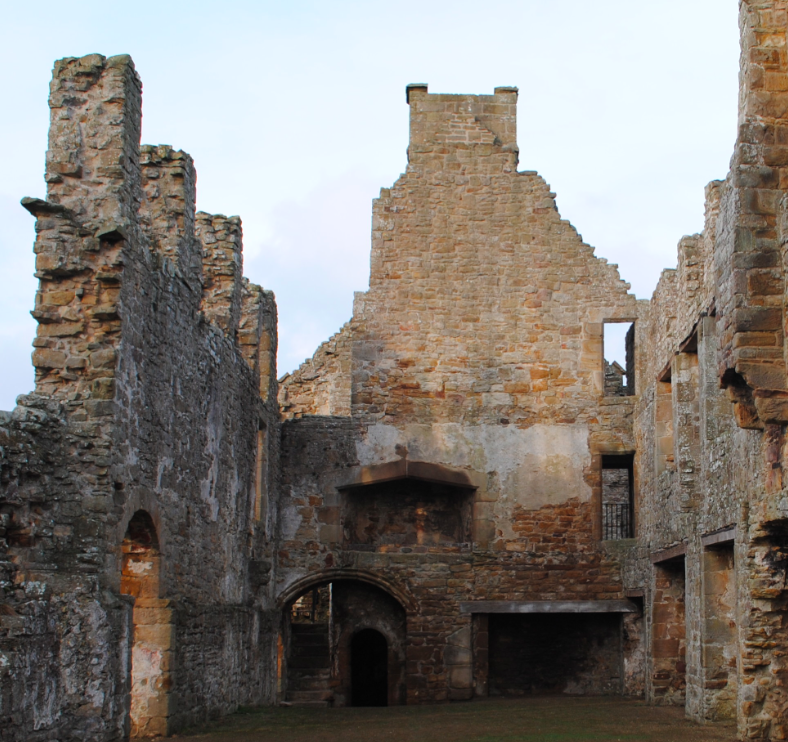 Dating to the mid 16th century, the east range of the cloister (above) was of three storeys and features a first floor fireplace with a flat pointed head with the remains of a warming house fireplace on the ground floor. 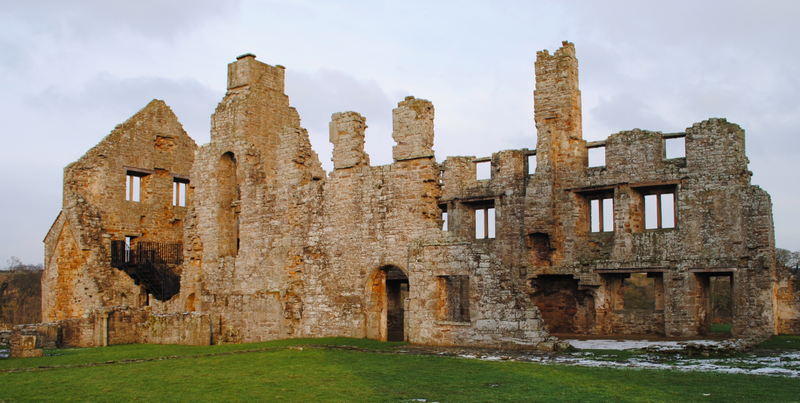 The Abbey was sold in 1770 to John Morritt of Rokeby Hall with his descendant placing the ruins in state guardianship in 1925. 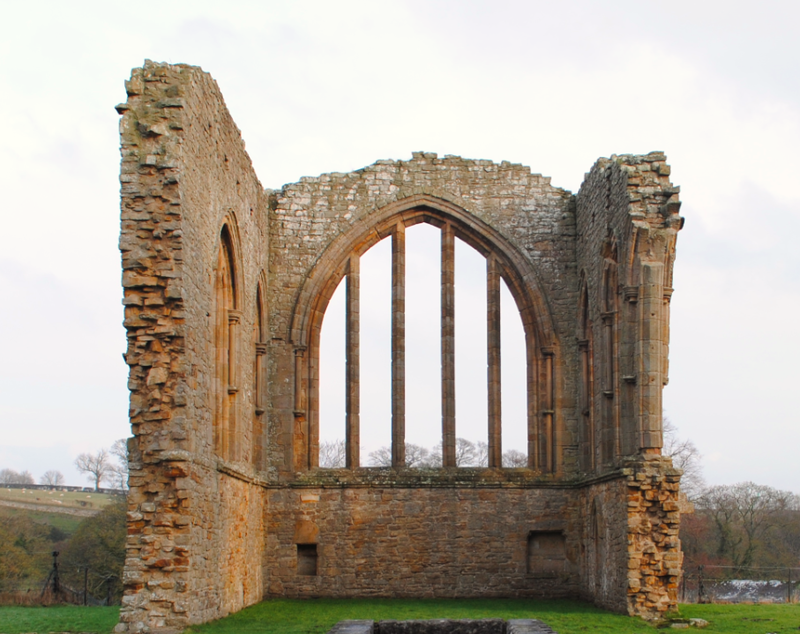 The ruins of Egglestone Abbey are a Scheduled Ancient Monument and Grade I Listed. 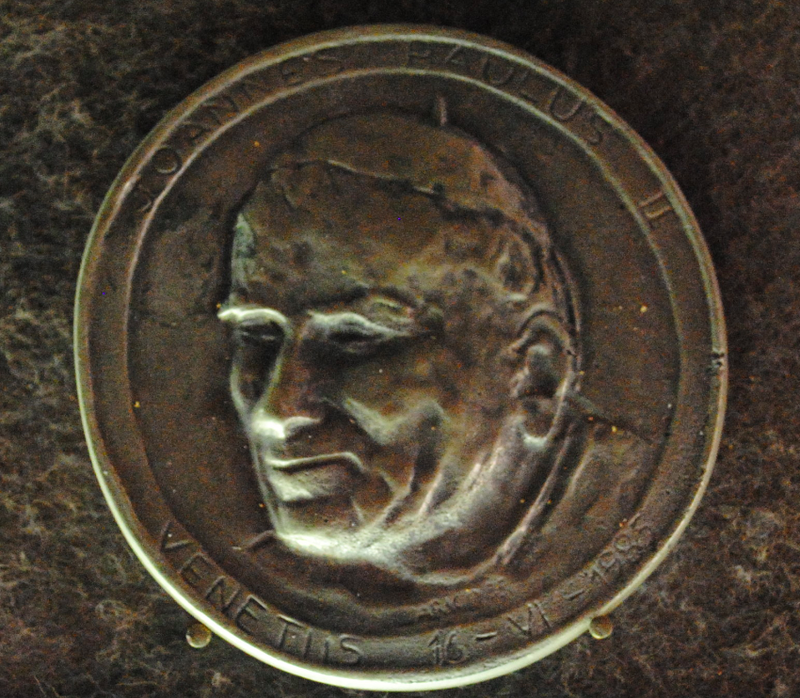 On display in the museum of Cattedrale di San Pietro are coins commemorating a visit made by Joannes Paulus II (Pope John Paul II) to the Veneto region in June 1985. 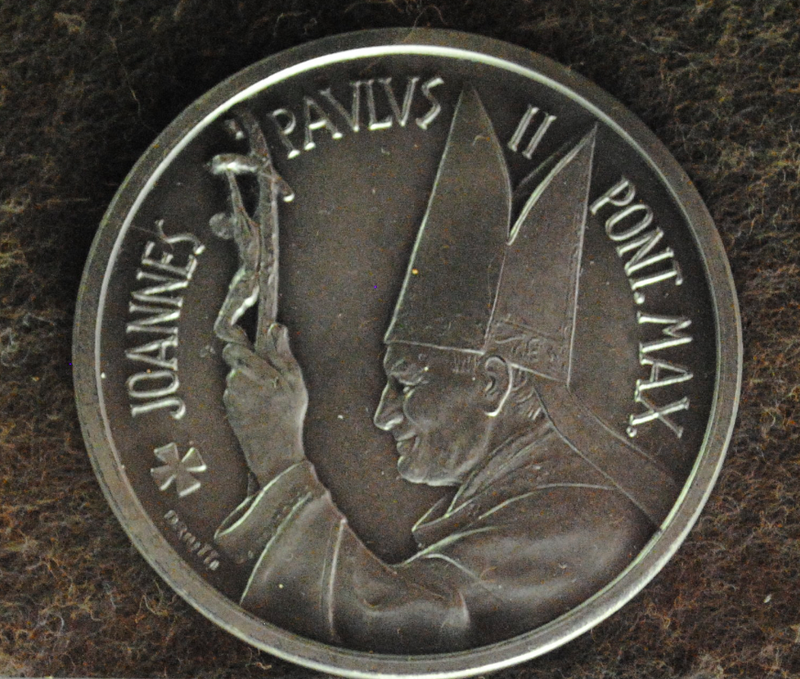 The above coin depicts Pope John Paul II wearing a mitre and pastoral pallium and commemorates his visit to Basil. S Marco on 16th June. The above coin depicts Cattedrale di San Pietro, Basilica Sancti Petri above the birth place of Pope Saint Pius X and commemorates the Pope’s visit to Riese, in the provence of Treviso, on 15th June. 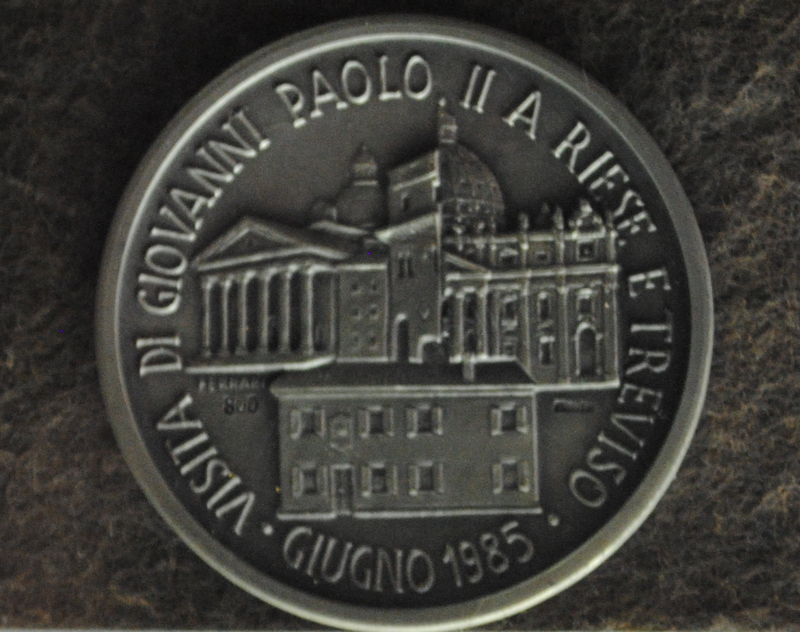 The above coin depicts a bust of the Pope and commemorates his visit to Venice on 16th June 1985. 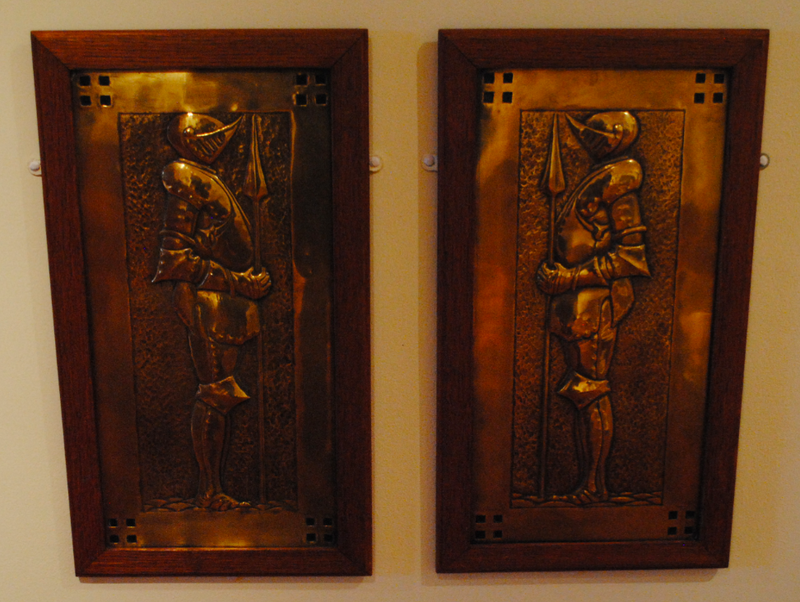 On display at Blackwell Arts & Crafts House, as part of the Glasgow Style: Arts & Crafts from 1890-1930 Exhibition, was two brass panels detailing Knights. Dating to circa 1900, the panels are the work of the 19th/20th century Scottish sculptor and silversmith Peter Wylie Davidson. Having studied at the Glasgow School of Art, Davidson founded a design and metalwork studio in Glasgow in the 1890’s and published a book entitled Educational Metalcraft in 1927. 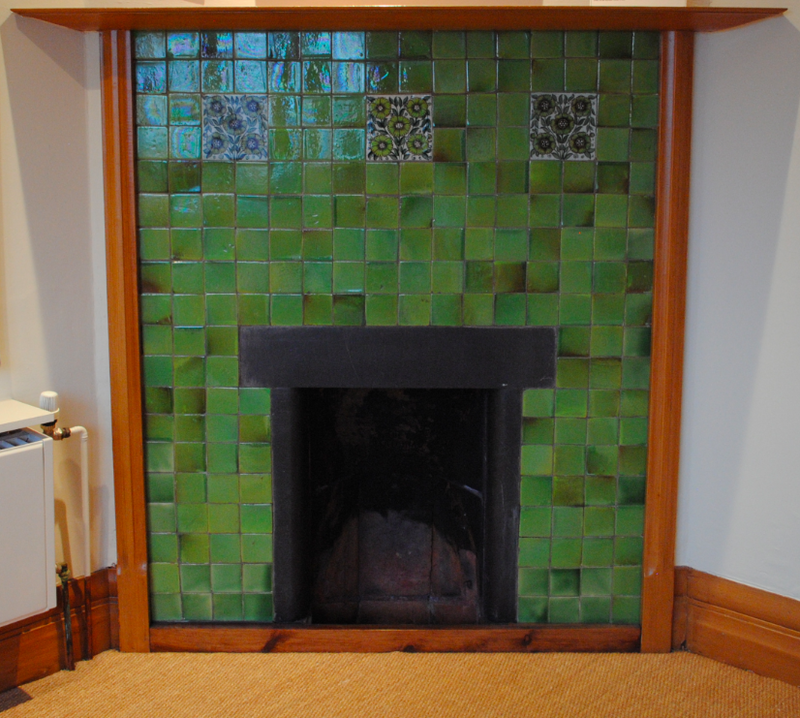 Blackwell Arts & Crafts House was designed by the British architect and Arts & Crafts designer Mackay Hugh Baillie Scott. In common with other Arts & Crafts architects, Baillie Scott incorporated elements from earlier periods into his designs for houses. 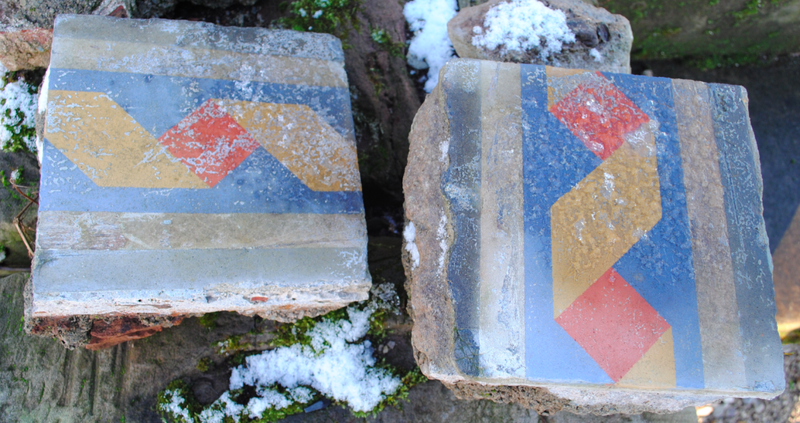 By recycling materials in this way, he was showing respect for the past by salvaging material that had little monetary value but represented the skill and vitality of craftsmen of earlier times. 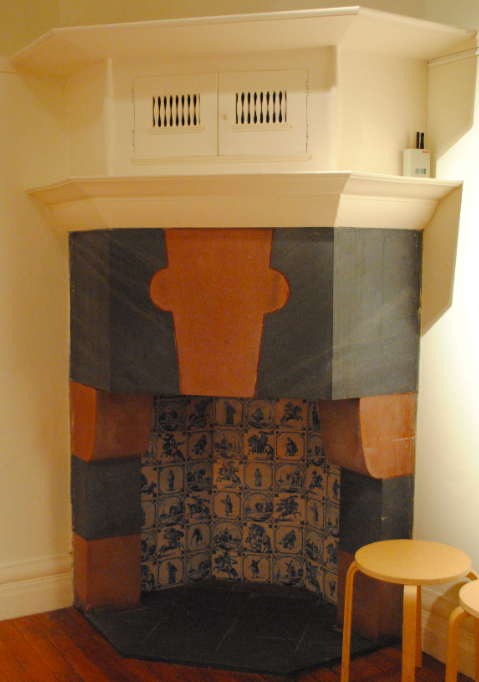 One example of this at Blackwell is in the Dining Room with the 18th century fire back being incorporated into the design. 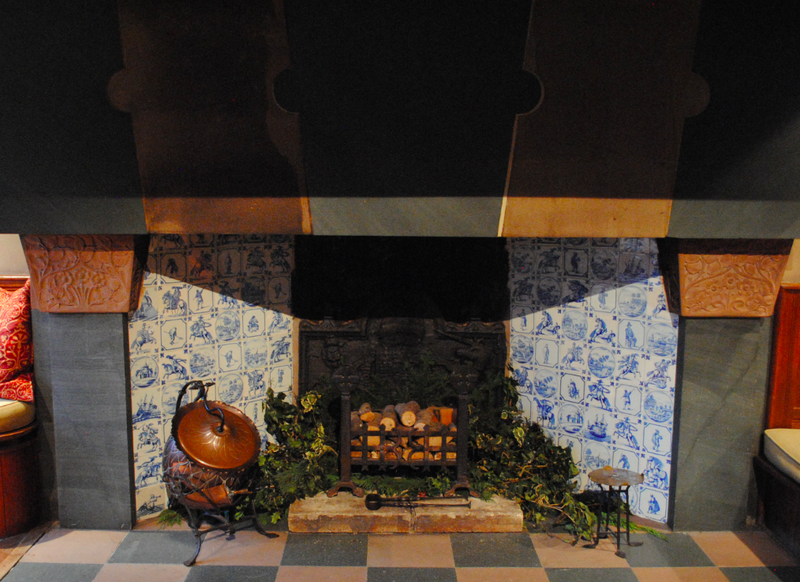 Seen as a substitute for the sun, Baillie Scott designed the fireplaces of the house with inglenook fireplaces appearing in several of the rooms. 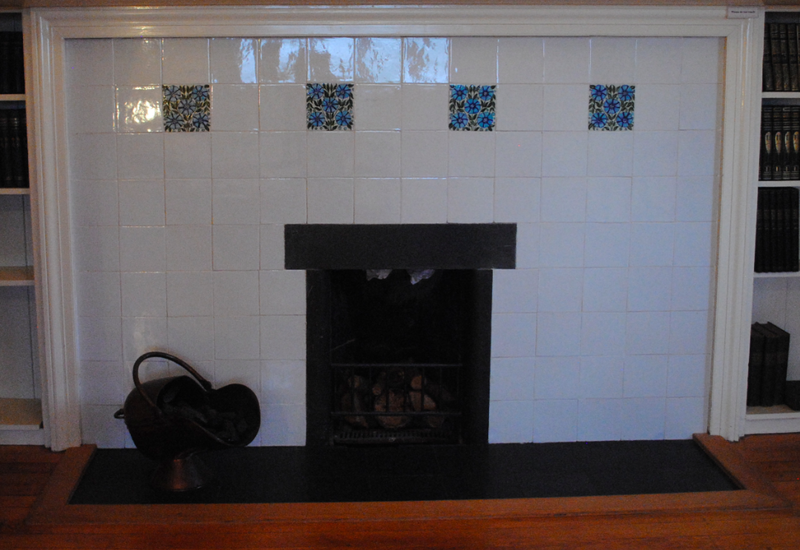 The fireplaces feature tiles designed by the English potter and tile designer William De Morgan who was a major figure in the Arts & Crafts Movement. 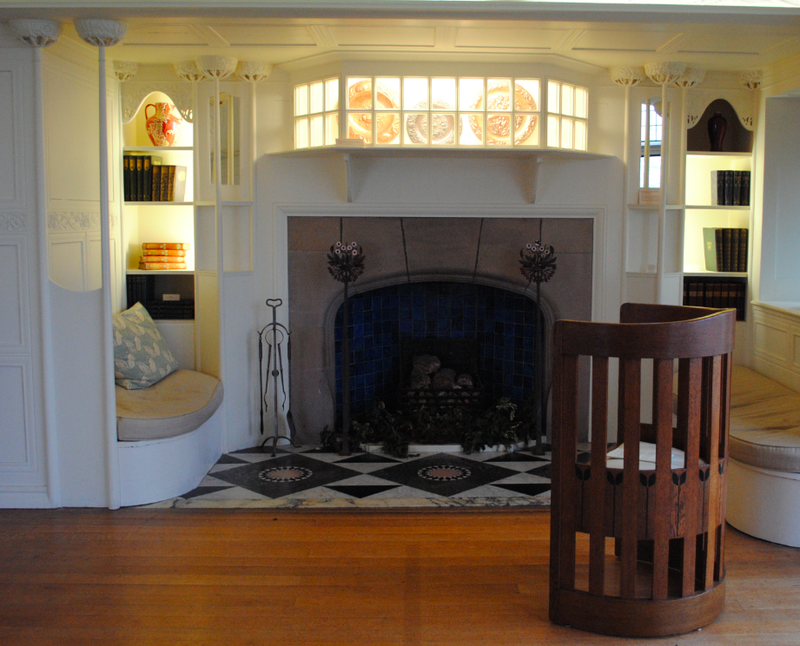 The inglenook fireplace in the White Drawing Room (above) is the most complex and elegant in the house. Incorporating many different elements, the fireplace features carved wooden capitals that branch out to reveal little birds, fruits and leaves. Each of the bedrooms was individually designed with bold colour co-ordinated schemes which linked the walls, windows, tiles and fireplaces. 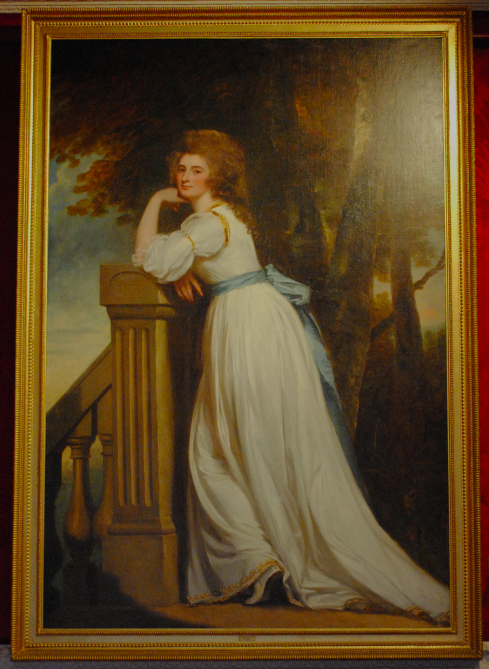 On display at Abbot Hall Art Gallery is a portrait of Catherine Hall, Lady Rouse Boughton. In 1782, Catherine married Charles William Boughton who belonged to a well established aristocratic family. In 1768, William inherited the estates of his maternal cousin Thomas Philips-Rouse and commissioned the above portrait of his young wife. The oil on canvas painting dates to 1785-1787 and is the work of the 18th century English portrait painter George Romney. The painting depicts Lady Rouse Boughton in a long flowing white gown, a type of garment often used by Romney to portray the female form to its full advantage. 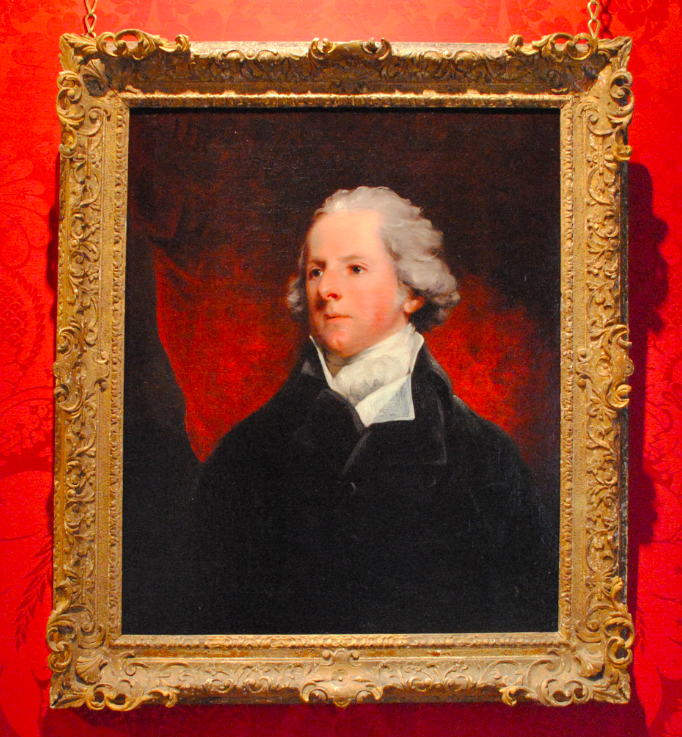 On display at Abbot Hall Art Gallery is a portrait of George Granville Leveson-Gower – the 1st Duke of Sutherland. George was the eldest son of the 1st Marquis of Stafford and was born in 1758. 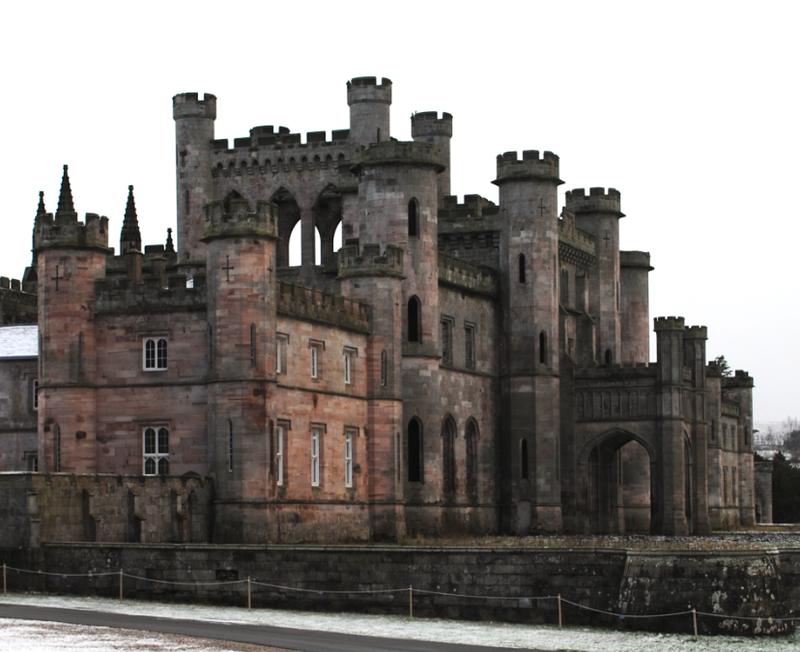 In 1785, he married the daughter of the Earl of Sutherland and he became notorious through the part he played in the Highland clearances in the early 19th century. 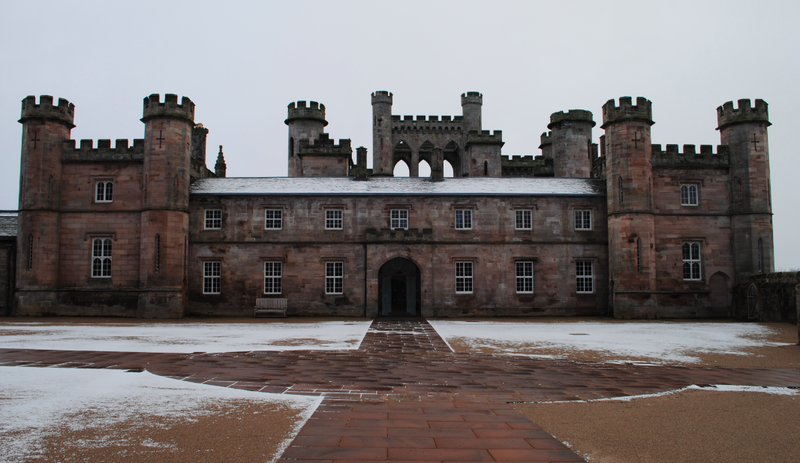 He was created 1st Duke in 1833 for his services to politics and he died in July of the same year at Dunrobin Castle. The oil on canvas painting dates to circa 1800 and is the work of the 18th/19th century English portrait painter Thomas Lawrence. Principle painter to the King at the age of only 23, Lawrence became president of the Royal Academy in 1820.